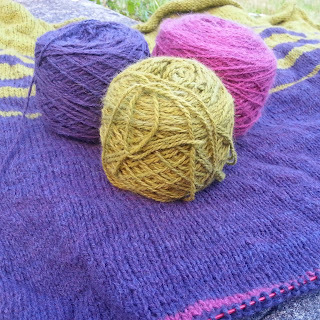 Once upon a time, possibly back in 2012, a busy knitter cast on for a project with some gloriously luxurious yarn. Four years later she discovers a project in her knitting basket. She has a file on her computer with some pattern notes from 2012 which in no way relate to what's on her needles now. She has vague memories of knitting and re-knitting this yarn a few times as she tries to decide what it wants to become. There are rows upon rows of stocking stitch, 150 stitches, a provisional cast on and that's it! The knitter has no idea what this was supposed to become. It's too wide for a rectangular shawl. She doesn't have enough yarn for a sweater. She loves the yarn and feels it should become something and she's been dreaming of knitting something stripey and easy lately and this fits that bill perfectly. She wishes it was slightly narrower as she would be able to make it longer. She's not sure how long she'll be able to make this piece. She's scanned through a few notebooks but can't find any clues but her notebooks are scattered everywhere and aren't particularly organised. She's also changed computers since 2012 and files may have been lost. So she has no idea what this project is. Does she carry on and hope the yarn will reveal what it wants to become? Does she rip it out...again? Problem is she's broken the yarn for some of the stripes instead of carrying it up the side, so ripping it out will result in some tiny balls. Any guesses as to what this is? The yarn is Shilasdair in a cashmere blend. Yes, you guessed, the labels are long gone. Watch this space to see what becomes of this project.